With the renowned high quality of Iwata, this Spray Gun Tanning Kit is for professional salon use with any spray tan product. 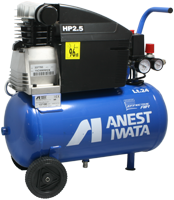 The Anest Iwata RG-3 has a 0.6 mm nozzle and comes with a large 110cc gravity cup. The Iwata Maxx Jet compressor is great for a salon airbrush tanning workstation or a mobile spray-tanning unit. It can run up to four Iwata airbrushes or similar airbrushes at the same time or a low-volume spray gun. Housed in a portable and sturdy case with a 2.5 litre air tank and a built in storage unit for all your airbrushes, beauty products and accessories, the Maxx Jet really allows you to take your work on the road. The kit also includes two cleaners. The Iwata Maxx Jet compressor is also suitable for running airbrushes for other beauty applications such as, nail art, body art or cosmetics. Please click here to see all other spray tanning kits. Warning: If you spray tan quicker or in higher volumes by using a spray gun, you will need a higher extraction rate than for an airbrush system. We advise that you seek expert advice from a ventilation company.